What is a simple way that artists use to sustain a viewer’s interest when looking at an image? Often artists rely on the choice of subject to catch a viewer’s eye and sustain interest. For instance, an image featuring shameful humour (schadenfreude) or extraordinary phenomena may be riveting at first but the attraction relies on novelty and once the intrigue of a particular subject diminishes so to does the ability to attract and hold a viewer’s attention. 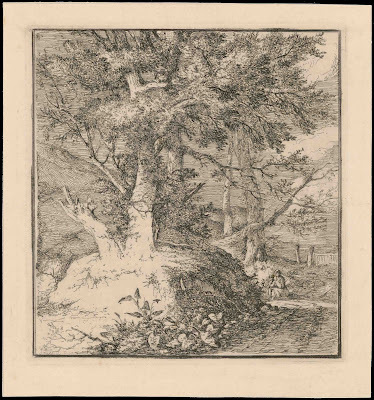 As an alternative to relying on the choice of subject to captivate a viewer, the following discussion explores a tried and tested approach to keeping a viewer’s interest with the focus on the etchings of John Crome. One way that some artists compose their images is to ensure that their arrangement of subject material takes into account the different perceptual propensities of the viewer’s divided brain (i.e. the conscious and calculated machinations of the analytical left hemisphere of the brain and the intuitive responses of right hemisphere) by using the Foote, Cone and Belding Grid as a guide (see the earlier post, Daniel Heimlich: Foote, Cone and Belding Grid). Another approach is to invite the viewer to read an image in incremental stages from left-to-right—the direction Western readers (i.e. as opposed to Hebrew, Arabic and traditional Oriental readers) are acculturated to contemplate images. Betty Edwards in her marvellous book Drawing on the Artist Within (1986) discusses the evolution of ideas about these incremental stages with regard to creativity (see pages 2–5) but they may also have a practical application as a means for catching and sustaining the eye’s interest. With a small quiver of trepidation, I wish to propose that these stages have a long tradition of being an integral part of picture construction which I will explain with reference to Crome’s prints. Moreover, the stages are laid out literally as part of the image in terms of pictorial zones that act like visual stepping-stones for the viewer’s eye to recognise, rationalise and ultimately to negotiate meanings projected by the image. In this scaffolding of incremental stages an image is broken into four pictorial zones starting from the far left. The first of these zones is the equivalent of the stimulation stage (the phase that the physiologist and physicist Herman Helmholtz terms “saturation” [Edwards 1986, p. 3]) where an artist presents the immediate sensations of an initial look at the subject without conscious comprehension of what is observed. 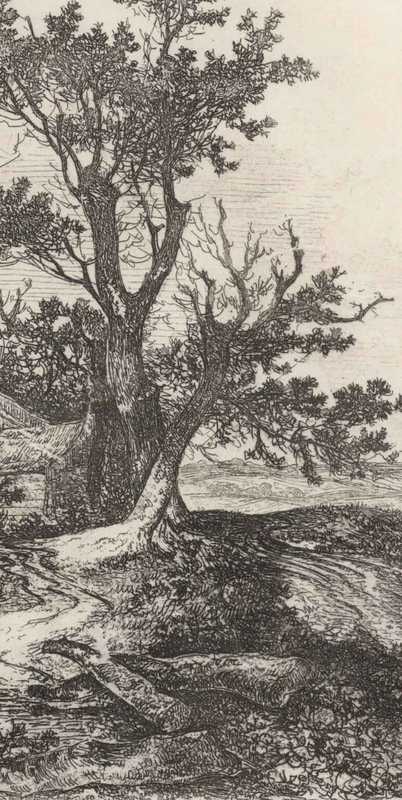 In Crome’s etching At Heigham (shown below) this area extends from the left side of the image to the first tree on the left (see detail further below). Here, seemingly random jabbed short strokes suggest that the artist is portraying his first glimpse of the landscape as if he is searching for details to depict. 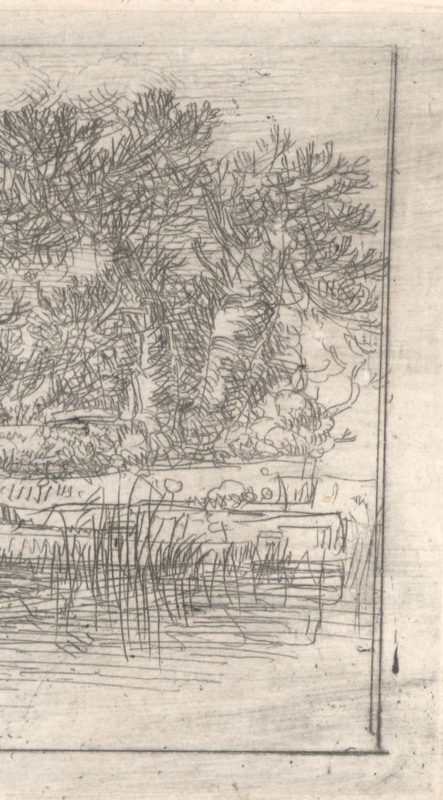 From my viewpoint, these patterned staccato-like strokes hint at what he is seeing as a sensory impression rather than a pictorial replication of what he is viewing. 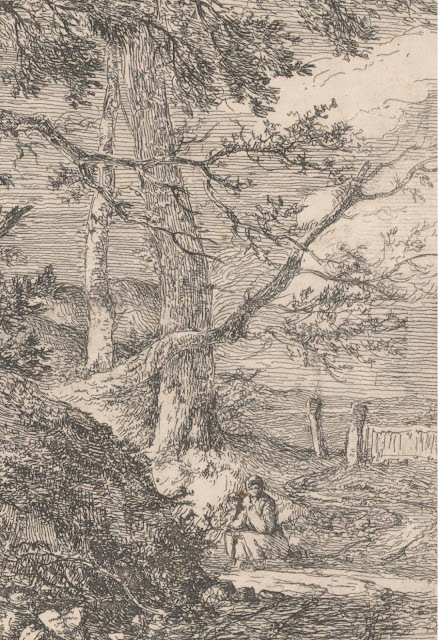 From the first edition of 60 impressions as issued by Mrs Crome in 1834 before retouching and the addition of the title. I am selling this print for $370 AUD including postage and handling to anywhere in the world. Please contact me using the email link at the top of the page if you are interested or click the “Buy Now” button. In the second zone, the area extending from the first tree on the left to the third tree away from the first (see detail below) the portrayal of the landscape details are shown by positive (black) lines where the silhouette edges of the tree forms and house are presented in their essential structural framework. This is formulation stage, or what Helmholtz terms as the “incubation” phase (Edwards 1986, p. 3), where the first impressions of the last stage are being synthesised. Here the strokes are clustered to represent conscious deliberations about what is observed and the clustering becomes progressively more frequent and denser towards the right. The third zone extends from the last zone to the further edge of the open shed at the water’s edge (see detail below). This is the stage where the artist’s perception is fully developed or what Helmholtz terms as the “illumination” phase (Edwards 1986, p. 3). Here, Crome’s portrayal of the scene moves from the structural marks of the former stage to mimetic marks drawing upon both positive and negative strokes to represent full recognition and understanding of the observed landscape features. From a personal viewpoint, Crome has now moved his approach to rendering (i.e. shading the subject) to a virtual elimination of individually important strokes and now employs tonal transitions as if portraying the surface of the subject rather than essential structures. In the fourth and final zone, extending from the last zone to the right side of the image (see detail below), the comparatively detailed rendering of the former stage is replaced with a broader handling of the portrayed scene. 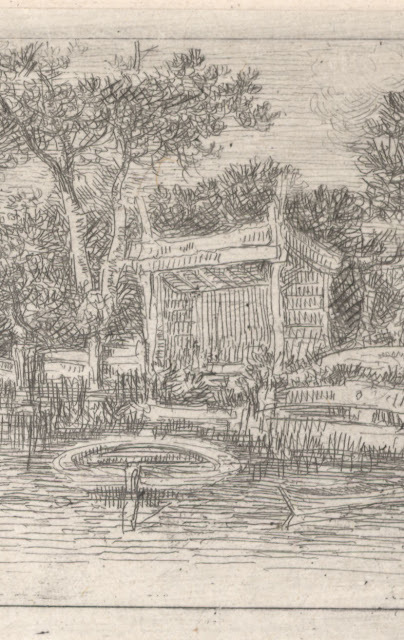 This is a stage where Crome anticipates what he is about to see next and has allowed the image to diminish in focal acuity so that the image does not draw a viewer’s eye “out” of composition. In a way, this last stage could be termed the “prognostication” phase. It may be viewed as a conceptual bookend to the very first stage in that the diminishing rendering of the landscape mirrors broadly the fuzziness of the first stage. The diminishing focus also completes the cycle in that the loss of focal definition may imply a shift to the artist’s next view of the landscape as an ongoing panorama. 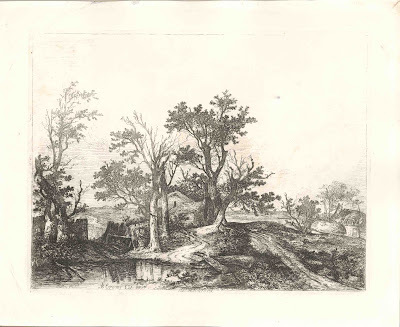 Of course I do not believe that Crome consciously planned any of his images to show sequential stages in his developing perception of landscape. Such an idea would be nonsense. What I am proposing, however, is that the sequence outlined above is a very natural way that many historically memorable artists have laid out their compositions to sustain a viewer’s interest—and the artist’s own interest during the execution of an image. After all, to evenly distribute pictorial information over an entire composition can result in visual indigestion where too much information competes for attention. There may be an argument that the above layout of a composition in sequential stages works best in long rectangular formats like At Heigham but this is not the case. To illustrate how this “natural” (i.e. subconscious) disposition is also applicable to more square-shaped formats, I will offer a personal interpretation of how the four pictorial zones can be seen in Crome’s etching, At Hackford, Norfolk. Condition: the impression is crisp and has been cleaned but not bleached. As a result of the cleaning process the plate mark has been flattened and is no longer evident. The print has been professional lined with thin Japanese paper. There are indications that the print has old creases but these are no longer evident. There is a mark in the sky to the right of the centre tree. This state is described by Goldberg “The title, At Hackford, is added in etched letters underneath. The plate was not much altered. The reflections in the water were darkened and the sky, as a rule, is hardly visible” (Goldberg, Norman 1978, John Crome the Elder: 1. Text and a Critical Catalogue, New York University Press, New York, p. 281.) In this impression the drawn horizontal line between the trees are clearly visible. I am selling this print for $270 AUD including postage and handling to anywhere in the world. Please contact me using the email link at the top of the page if you are interested or click the “Buy Now” button. The “saturation” zone on the far left of At Hackford, Norfolk extends from the border to include the pair of large trees on the left (see detail below). 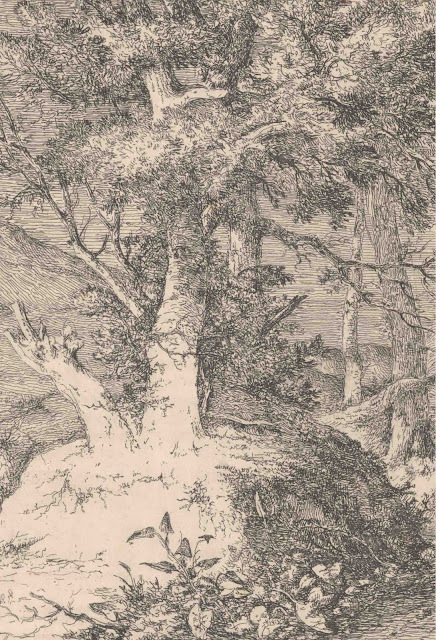 From my viewpoint, the plethora of details in the rendering of the dark tree and the ambiguity regarding where the lighter tree is grounded in space gives me the impression that I am not supposed to dwell in contemplative looking at this area of the composition. Going further, the spiralling form of the darker tree creates an “X” intersection with the lighter tree that psychologically advises me not to look there. Although such a reading of this zone is a personal interpretation, I see the first zone as a space framing the landscape features at the centre of the composition. In short, Crome uses this zone to offer an amalgam of pictorial details about landscape—a narrow screen of organically twisted forms in a flickering light created by positive and negative spaces—representing a developing but as yet an unclear vision of what he is showing the viewer. In the second zone, Helmoltz’s “incubation” stage, extending from the last zone to midway between the two centre sets of paired trees (see detail below), Crome clearly grounds the landscape features shown in this area. These features are also rendered with focus on their silhouette shapes and their structures are presented in an unambiguous way (i.e. 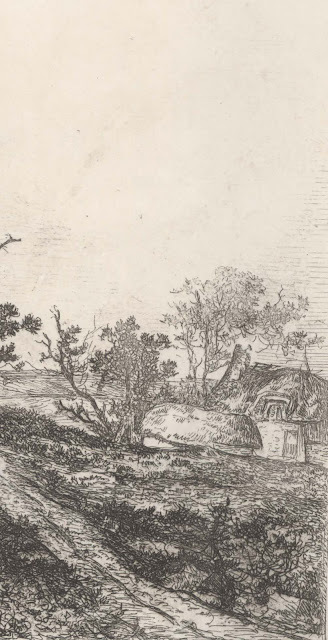 a viewer should have no difficulty in understanding the form of the trees and the contours of the terrain). The treatment of the features in this zone fit well with the idea of showing the essential characteristics of the subject. The third zone, Helmoltz’s “illumination” stage, extends from the last zone to the far reaches of the second set of paired trees (see detail below). 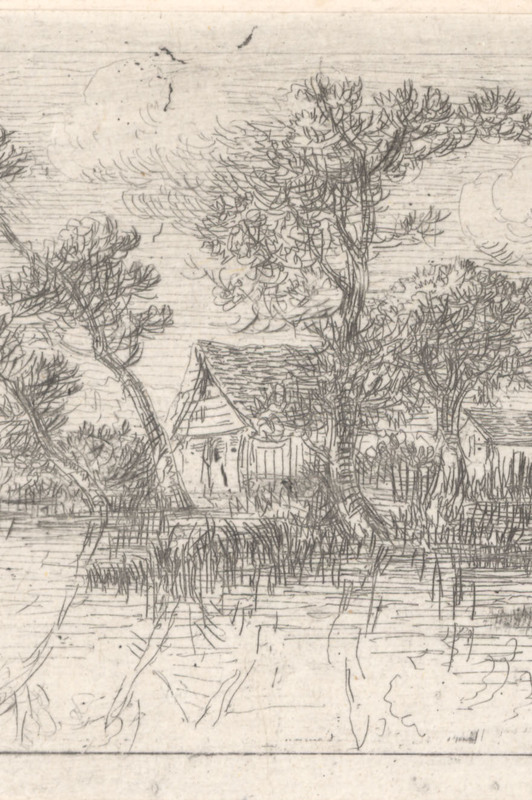 In this area Crome shows the superficial “skin” of his subjects such as the detailed rendering of textures in the foreground and the careful tonal gradations in the rendering of the road. In keeping with this degree of focal resolution, the treatment shows Crome’s fully resolved vision of the landscape at this point. To conclude the transition of pictorial zones, the fourth zone representing the “prognostication” stage extends from the third zone to the right side of the image (see detail below). 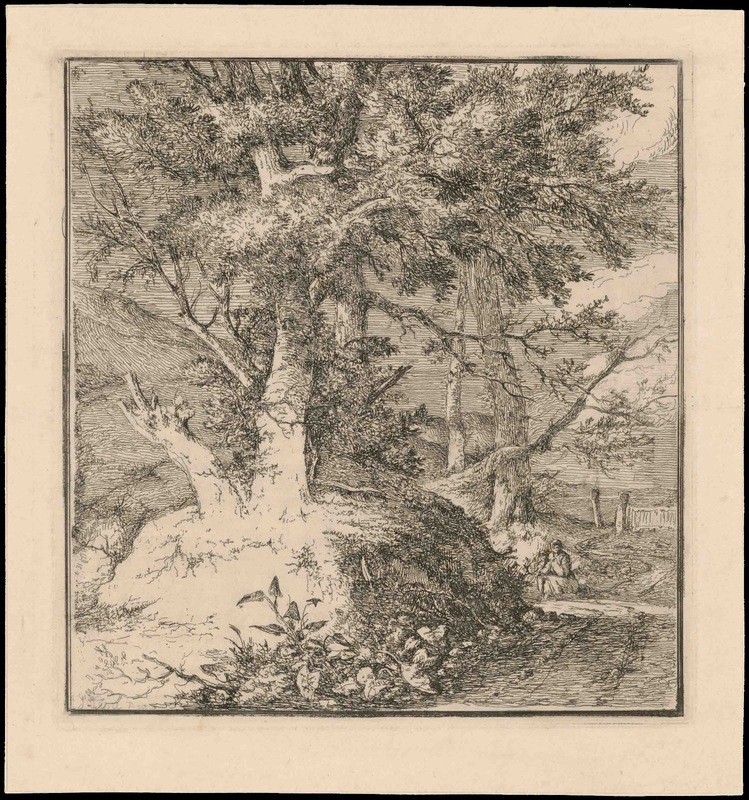 In this area Crome diminishes the harsh tonal contrast portraying the landscape of the previous zones and by so doing diminishes the focal clarity of what a viewer can see. Crome also softens the tight knotting of rhythms of the previous zones so the eye can now to wander unimpeded along the course of the road as it slopes gently downwards from the centre trees to the lower right corner and the eyes can also traverse unimpeded down the soft contours of the terrain. This shift from closed to open space (i.e. 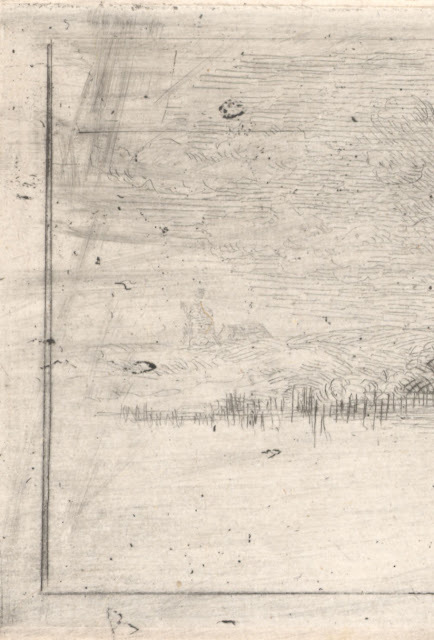 from constrained window-like views of landscape in the preceding zones to an unconstrained view) is important as this is the zone where the artist foreshadows what he may be seeing in his next view of the landscape. The idea of creating prints in such a way may at first seem to be a counter-creative challenge but the real issue is that the approach provides a simple way of giving order and logic to a viewer’s reading of an image. From personal experience, if the lighting on a subject comes from the top-front-left (in accordance with the Western lighting convention) then the four zone approach discussed above is naturally geared to portray the lighting effect without a major challenge. Consider how Crome’s angle of lighting in A Composition (shown below) lends itself perfectly to this approach. Condition: an exceptionally fine and rare impression with the characteristic “silvery” quality of the first issue in the Mrs Crome edition of 60 impressions in 1834. The print has a slight age toning and has conservator’s tape hinging. Overall it is in virtually pristine condition. This state is described by Goldberg “Black lines are drawn round the plate, lines are added in the sky to the right, and work is added on the mound to the left. In this state the plate was left by Crome, and was published in Mrs. Crome’s set. In the left corner bottom, J. Crome fecit, is in etched letters” (Goldberg, Norman 1978, John Crome the Elder: 1. Text and a Critical Catalogue, New York University Press, New York, p. 282). I am selling this print for $430 AUD including postage and handling to anywhere in the world. Please contact me using the email link at the top of the page if you are interested.